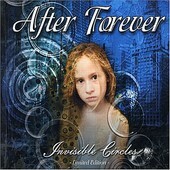 After Forever is a Norwegian metal clan whose latest 12-track release is an operatic journey through the outer reaches of metal. Armed with keyboards, a twin guitar assault, and some of the most beautiful vocals this side of any opera house, Invisible Circles breathes new life into the term rock opera. Utilizing the elite of Norway's classical music circle enhances each track significantly more than any synthesizer could, giving each track the rich, organic tones that only real musicians can make. Making what Lacuna Coil and Evanescence do look like a high school production, After Forever's credentials speak as loud as the songs do, and when cranked, tracks like the Gothic drive of "Through Square Eyes" and majestic metallic might of "Beautiful Emptiness" appeal to a multitude of senses that other bands simply cannot reach. If you clamor for a full-scale metal production, look no further than this gem.